Quickbooks offers online and on-premise accounting solutions geared toward small and medium-sized businesses. Organize your books in one platform and easily share everything with your accountant. Stay on top of your finances and know where your money is going. Track income and expenses, send invoices and accept payments anytime, anywhere. See the big picture and gain a quick overview of how your business is performing. Run reports in one click and access a real-time accounting dashboard. Learn more about the features or try Quickbooks cloud accounting software for free. Add invoices and estimates from no CRM in Quickbooks. Attach Quickbooks invoices to existing leads automatically. Capture lead information from a Quickbooks customer to create a lead in your no CRM account. 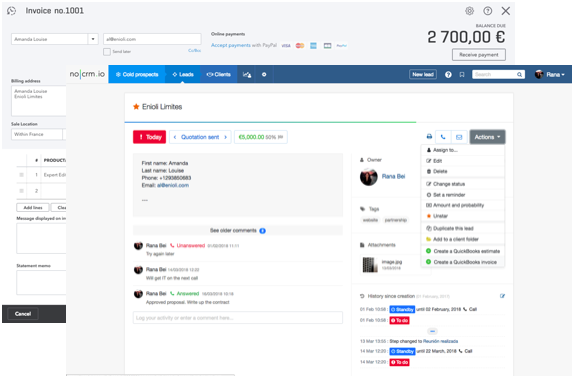 Create new customers in Quickbooks from leads in noCRM.io with the Lead Clipper. Mark leads as WON, move them to the last step in the sales cycle and update deals amount automatically when a Quickbooks invoice is attached. noCRM.io is a lead management software that eliminates the distractions of a standard CRM and places leads at the heart of its system. Easily create leads from LinkedIn, business cards, e-mails, and web forms. Stay on top of leads and raise conversions with customizable activities. Login to your noCRM.io account and go to Admin Panel to select Quickbooks. Enter your account name, click on Connect to Quickbooks and enter your credentials to streamline your accounting. For more information on what you can do with our Quickbooks integration, visit our dedicated help page.